Whether you're starting a business or just want to make some extra cash, selling on BidzKing is fun and easy. When you list an item, we make recommendations based on similar listings. These suggestions can help you sell your item faster and at a better price. Start by describing your item in clear, simple terms. We then identify the most relevant category so potential buyers can find it fast. We also provide pricing guidance and tips. Learn more about creating a listing, and tips for successful selling, or just start selling now or click Sell at the top of most BidzKing pages. We recommend that you know the rules for sellers and BidzKing policies on prohibited and restricted items, and what's allowed and not allowed when listing and completing a sale. Fees for selling on BidzKing's apply to most listings. When you have your listing up and running, you can check to see if anyone's bid on or bought it by going to the Sell section of My account. You can also revise your listing using the edit feature. Communicate with your buyer: With BidzKing checkout, we notify you by email when the buyer has completed checkout. Important: Contact your buyer directly if you haven't heard from them within 2 days of the end of your listing. You can create your shipping label and packing slip on BidzKing. If you use free carrier pickup (available with orders that include Priority Mail or for a small on-demand fee), you can save a trip to the post office. Leave your buyer Feedback: Your Feedback about your buyer is important for other sellers. Learn more about Feedback. BidzKing is based on trust between buyers and sellers. Sellers used to be able to leave negative feedback for buyers. However, we found that generally, when buyers had bad experiences with sellers, they were reluctant to leave neutral or negative feedback out of fear the seller would retaliate by leaving negative feedback for them. When buyers did receive unfair negative feedback, they usually decreased their shopping on BidzKing. This made the Feedback system as a whole less reliable. So BidzKing updated the Feedback system to let buyers effectively evaluate sellers through feedback left by other buyers. Buyer requirements: Sellers can add buyer requirements to their listings to prevent unwanted buyers. You can block buyers who have too many policy violations, unpaid items, or who aren’t registered with PayPal. This can help you dramatically reduce your number of unpaid items. To access this tool, go to My BidzKing > Account > Site Preferences > Buyer requirements. Purchase requirements: If you use Buy It Now, you can require buyers to pay you immediately using PayPal. Report a buyer: Sellers can use Report a buyer to report an unpaid item, an issue with feedback, or any other problem with a buyer. BidzKing investigates these reports, and will suspend or take action against buyers with repeated issues—as well as remove any transaction defects that are in violation of BidzKing policy. Does BidzKing mainly side with the buyer in case resolution? No. We strive to make sure cases get resolved fairly to the satisfaction of both parties. If you feel a case has been resolved unfairly, you can appeal the decision by providing new information to the case, such as additional information from the shipping carrier to Customer Support within 30 days from the day the case is closed. BidzKing reviews information and documentation from both buyers and sellers in detail before making a final decision. If a seller's appeal is granted, all defects for that transaction will be automatically removed. I reported a buyer. Can you tell me the results of my report? To make buyers feel comfortable about buying, we don’t disclose the results of a report. Reports from sellers help us make BidzKing a great experience for everyone. Since the launch of the enhanced Report a Buyer feature, we’ve had more reports submitted by sellers. In response, we’ve been able to take more actions to prevent abuse by buyers. If we take action on a buyer who is reported for policy violations, any transaction defects created by that buyer are automatically removed. We will let sellers know if they have had defects removed either on theSeller Dashboard or via a monthly communication from BidzKing. What should I do when I feel a buyer is misusing the Feedback system by threatening me if I don’t give in to their demands? First, place yourself in the buyer’s shoes and ask yourself if the buyer is asking for something unreasonable. You’ll find that most buyers just want to resolve an issue. If you feel the buyer is in fact using low Feedback as a threat or the buyer’s demands are beyond what you promised, please report that buyer. See BidzKing Feedback Extortion policy to learn more. What is BidzKing doing to get buyers who repeatedly violate BidzKing policies off the site? Backed by a large-scale automated detection system, our team keeps a look out for things that could cause problems for our sellers. When a seller reports a buyer—or when BidzKing identifies an issue, such as a closed Unpaid Item case or Money Back Guarantee claim—BidzKing's data analysis model reviews the buyer’s behavior and scans over 250 variables to see if the buyer has a pattern of violating BidzKing policies. If it sees a pattern, the Seller Protection team steps in to investigate the buyer’s behavior. To find out how we detect and deal with buyers who violate our policies, see How BidzKing Protects You. Depending on a buyer’s behavior, there are a number of actions the team can take—from issuing a warning, to setting buyer restrictions, to suspending the buyer from our site. If we take action on a buyer, all defects created by that buyer will be automatically removed. What can I do if I lose an BidzKing Money Back Guarantee case for an item not as described? If a case is closed in the buyer’s favor for an item not as described, you can appeal the decision by providing the appropriate documentation—including any new information or communication between you and the buyer—to the BidzKing Resolution Center within 45 days from the day the case is closed. If the decision is reversed, you will be refunded the reimbursement amount back to the reimbursement payment method on file with us. Other fees will not be reimbursed. Additionally, any defects for the transaction will be automatically removed. I sold an item but the buyer hasn’t paid. How do I get my money? BidzKing. This will provide a documentation trail in case the issue is ever escalated to BidzKing. You can open a case as early as 2 days after the transaction ends. The buyer will have 4 days to make payment. If an unpaid item case closes without payment, you will receive a final value fee credit and any transaction defects will be automatically removed. Why sell sports cards and memorabilia on BidzKing? How can I help buyers find my items? Maximize the 80-character limit for titles by including team, authenticator, player, year, etc. Be sure to call out any flaws or special characteristics of your item — this will build buyer confidence and help protect you in the event of an BidzKing Buyer Protection case. Learn how to maximize your potential in Best Match sort. How do I find out what my item is worth? 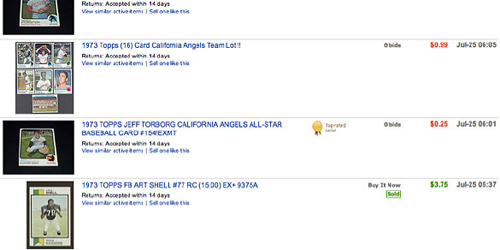 Millions of sports cards and memorabilia have been sold on BidzKing. Search BidzKing's completed listings to research the value of your item. To see completed listings, search for your item and then click 'Completed Listings' under 'Show Only' on the left side of the search results page.Completed listings that appear with a price in green were sold. What are the top tips for taking great photos of sports cards and memorabilia? Remember, you have 12 free pictures for each listing. For the best possible display of your listing on all BidzKing pages, pictures with a 1600-pixel dimension on the longest side is recommended. Take a lot of detailed, close-up pictures from different angles. Capture important features (autograph, date, grade, etc.) in your photos. Do not use stock photos or photos from another listing. Take pictures of your exact item. For sports cards, consider using a scanner. A camera will work fine, but taking advantage of the flatness of cards with a scanned image produces a clean look. Plus, it saves you time. You can scan the front of multiple cards at once then turn them over and scan the back. Crop the images and upload. If there are any flaws, clearly show them in a picture; this will build buyer confidence and help protect you in the case of an BidzKing Buyer Protection case. For general tips on how to take great photos, visit the Photo Center. Which listing format should I use? Learn more about Best Offer. Check out BidzKing's Top 10 selling tips. What are the best shipping practices for sports cards and memorabilia? See below for best practices when it comes to shipping items from this category. See more Shipping Best Practices. How can I be protected as a seller? Report concerns with a buyer in our Seller Reporting Hub. Visit the Seller Protection page for more information. Parts compatibility is a better way for sellers to list parts that fit a variety of vehicles. It's also a great way for buyers to find parts that fit their car, truck, boat, motorcycle, or power sports vehicle. With parts compatibility listings, you can create one listing describing a single part and add a complete list of compatible vehicles. This eliminates the need to list one part multiple times to ensure all compatible vehicles are found in search. Why should I use parts compatibility listings? Using parts compatibility, you can include a detailed list of compatible vehicles for a single part right in one listing, reducing the number of listings you need to create. Compatibility information appears on the item page and is searchable. You can then use your 80 character title for other popular search elements like brand or location on the vehicle (e.g. driver, passenger) to market your listing better. What is the benefit of using parts compatibility? Parts compatibility is to help you List and run your business more smoothly by simplifying listing creation and management and reducing repetitive listing. Buyers will be able to find parts faster and with more confidence that the part will fit, resulting in fewer returns and inquiries. Plus, fewer listings mean you pay less in fees. Do I have to use parts compatibility in my listing? No, However, listings that display compatible vehicle data will help get your relevant items in front of buyers via search and helps to avoid using multiple listings for the same item, a violation of BidzKing's Duplicate Listing Policy. In what categories can I list with parts compatibility? We will announce the release of parts compatibility listings in additional categories as they become available. Will I get better search visibility if I use parts compatibility? Consolidating your listings using the parts compatibility feature may help your visibility in Best Match search results. Search for your product in BidzKing's parts catalog while you are listing your item. If the item you are listing is in our parts catalog, a complete list of vehicles that your part fits will be filled out for you on your listing, along with other important information like brand and manufacturer part number. If you do not find a match for your product in our catalog, you can fill in necessary compatibility information manually—for tires and wheels by tire/wheel specification, and for all other parts use the vehicle details—year, make, model, and trim and engine where necessary. Why is the listing flow different for some sub-categories? For parts with clearly defined specifications like tires and wheels, you'll be asked to provide details about the part itself. For example, specifications for tires include width, aspect ratio, rim diameter, load index, and speed rating. For all other parts, you'll be asked to provide details about the vehicle for which the part is compatible. These details include year, make, model, trim, and engine. For tires, specify compatible vehicles using the comprehensive BidzKing category. Or use Item Specifics—Section Width, Aspect Ratio, Rim Diameter, Load Index and Speed Rating. For Wheels, use Rim Width, Rim Diameter, Bolt Pattern and Offset. Make sure you exclude any special characters (e.g. #,*,$,%) in Item Specifics for your listings to trigger compatible vehicles in View Item and Search. How do I list using parts compatibility? If you see too many parts, you can narrow down your search by adding more information in the 'Enter Brand, Product type, or Model' box or by specifying a vehicle that is compatible with your part. How are the compatible vehicles displayed in my listing? In eligible categories, compatible vehicles are listed in a 'Compatibility' section in the item description just above the 'Item Specifics' section. The buyer will see a list of all vehicles compatible with your part. Vehicle details include year, make, model, trim and engine. These are the details you can enter in the manual process of entering vehicle compatibility. What if I do not know or don't want to provide all the information about a compatible vehicle? Even if you do not enter all the details (e.g., you provide year, make, model but not trim or engine), the list of compatible vehicles will still include compatible vehicles with the details you provide. Example: A seller has a headlight that fits all 2002 Dodge Durango trucks. The seller chooses Year: 2002, Make: Dodge, and Model: Durango. The system recognizes that this 2002 Dodge Durango has multiple trims and engines. The system presents all compatible 2002 Dodge Durango trucks, with all trim and engine options, for inclusion in the vehicle compatibility list. Please note the system will return only information on vehicles using the details you provided (in this case 2002, Dodge, Durango). What if my part is not in the BidzKing category's? If your part is not in the BidzKing category and you know with which vehicles it is compatible, you can add them to your listing by providing year, make, and model of the compatible vehicles. You can then specify select trim and engine information, or you can select all available trims and engines. What if I disagree or am not sure if the compatible vehicles for my part are correct when selecting a part from the category? If you are unsure that the information returned to you when you input your part type, manufacturer, or number is accurate, you can manually modify the compatibility information on the listing, or you can list the part manually without selecting a product from our category's. Should I repeat the compatibility information in my title or description? There is no need to repeat compatibility information in your listing title. Instead, use your title for popular search elements like brand, part type, manufacturer part number, equivalent OEM part number, part name, color, size, material, location on the vehicle, and any other part numbers (e.g., Platinum number). Old title: Ford Ranger 88/07 Short Bed New Tonneau Bed Cover 6ft. You can repeat compatibility information in your listing description, but this is not essential since this information will already be displayed on the compatibility tab and is used in search. Compatibility information in the description may not be surfaced in search. Can I transfer compatible vehicle information in one of my existing listings into a new listing? Yes, you can use information from your existing listing in a new listing with parts compatibility by using the 'sell similar' or 'relist' options in the Sell Your Item form. Be sure to create a new title using descriptive popular search elements with your new parts compatibility listing. Please be certain the information you transfer to your new listing is correct since you are responsible for presenting accurate information about compatible vehicles. Do BidzKing tools support parts compatibility listings? View tutorials about how to list replacement parts and Tires & Wheels with SYI or Pro Store here. I use a third party service to help create my listings. Can I use the a parts compatibility feature? Check with your third party service provider or check here to find out which service provider will support this new feature. If I use a parts compatibility Lister, how do buyers find my item? Most buyers search for parts by entering the part description and information about their vehicle. With parts compatibility, your listing will appear each time a buyer searches for relevant parts by describing the vehicle—not just when the title matches the individual keywords. With parts compatibility, search will return listings using the vehicles in the compatibility section of your listing, the keywords in your title, and certain product identifiers like brand and manufacturer part number. This means you can use your title for more descriptive keywords and popular search elements to market your listings better.